Beaches are the best, but coastal towns are even better. Destinations like Pensacola offer the best of both worlds: long walks on sandy beaches and every ocean activity you can think of, mixed with a dose of city culture. The revitalized downtown area in Pensacola is already hopping, with plans for even more destinations on the books. Condé Nast Traveler recently named Pensacola Beach as the most beautiful place in Florida, just one of the accolades bestowed on this picturesque beach. Pensacola is located on the far west side of the Florida Panhandle along the Gulf of Mexico, which means that the same turquoise seas and sugary sand seen at popular destinations like Destin and Panama City are also here. Its location off major highways gives this city an edge, however; driving there doesn’t involve so many routes through those small towns with 30 MPH signs. For those who would fly, the Pensacola airport offers non-stop service to 17 major cities with 100 daily flights. Having a car is handy, since the Pensacola beaches are 10-15 minutes from downtown, although drivers for Uber and Lyft are plentiful. Parts of Pensacola Beach have a retro, kitschy vibe. Check your bags at the Hilton Pensacola Beach and hit the expansive beach right out the back door. The hotel can set you up with a beach chair and umbrella, or you might want to go for a walkabout on your own. An indoor and outdoor pool, plus a fitness room, provides plenty to do on-property at any time of year. 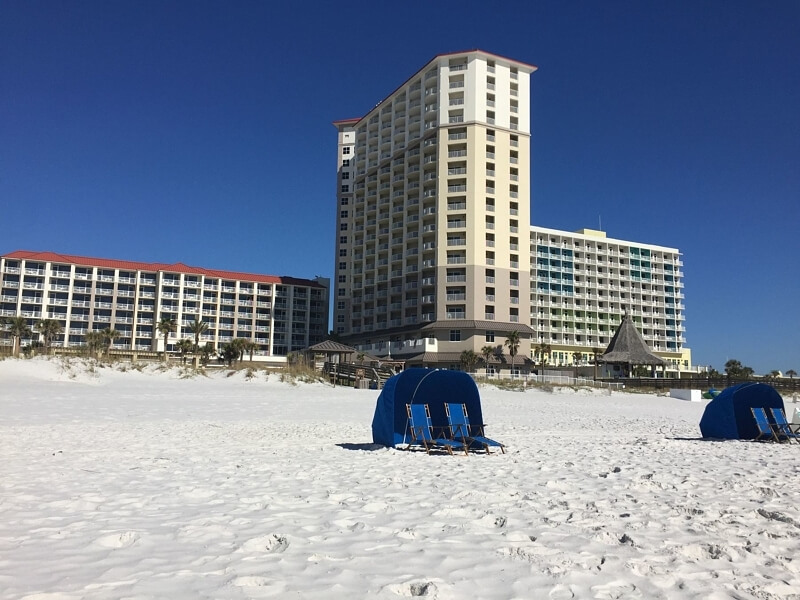 Easy access to the beach is part of the appeal of the Hilton Pensacola Beach. Walk across the street for dinner at Red Fish Blue Fish, a casual waterfront establishment with a relaxed vibe — i.e. playing Jenga around a fire pit. The restaurant likes to point out that all their seafood comes in fresh that day (never frozen), so fish tacos are always a popular choice. They’ve also got an impressive raw bar, with Ahi poke, ceviche and oysters on the half shell. The exterior of Red Fish Blue Fish gives a clue that this waterfront restaurant is relaxed and unpretentious. Fish tacos at Red Fish Blue Fish might feature mahi or whatever the fresh catch of the day is. Tables and games al fresco are part of the charm at Red Fish Blue Fish. Get a hearty breakfast at the Hilton and then cross the bridges to downtown Pensacola for some exploring. Start at a charming interiors store that’s off the beaten path, 1514 Home, the showroom for In Detail Interiors. Sure, you can buy an amazing light fixture or chair easily shipped back home, but the smaller treasures in there are just as fun: vintage barware, witty plaques and paintings by local artists. Down the road on Ninth Avenue is Duh, a sprawling home and garden store that also has clothing, jewelry and smaller gifts. Eggs Benedict — in its multiple variations — is a specialty at the Hilton’s restaurant, H20. Take a ramble through this sprawling historic house, now filled with interior design goodies. Each room at 1514 Home is packed with decorating treats, and don’t miss the renovated kitchen (cheerfully decked out with a yellow range and colorful accessories) designed by owner/designer Cheryl Clendenon, known nationally for her award-winning kitchens and baths. Wallpapered ceilings and vibrant window treatments provide a backdrop to the fun merchandise at 1514 Home. When you’re hungry, the permanent food trucks (actually, Airstream trailers) at Al Fresco are where a lot of the locals eat, with offerings that run the gamut from chicken and waffles to barbecue. Top off the meal with a gourmet coffee and some sweets across the street at The Bodacious Brew, a popular coffee shop started by local entrepreneurs. From there, stay on Palafox Street for a good stroll of the revitalized area. Stores and bars will beckon you, but if you want to be more high-brow, there’s the Pensacola Museum of Art, an art museum associated with University of West Florida. A walk through historic Pensacola Village will take you by houses and churches centuries old — but there’s even a brewpub in a converted building to wet your whistle. Airstream trailers serve downtown Pensacola visitors and residents in the aptly named Al Fresco park. Locally owned Bodacious Brew lures downtown residents and visitors both on the popular Palafox Street. If you plan accordingly, the Foo Foo Festival in November is just one of the many yearly festivals to check out in Pensacola. Here, the Umbrella Sky Project takes over Palafox Street for some Instagram-worthy street art. End the day at a downtown restaurant on the water for a sunset cocktail and dinner, such as The Fish House, with Southern-inspired specialties. Start with the fried green tomatoes as an appetizer, then move on to a catch-of-the-day with sides of smoked gouda grits and black-eyed peas. Ask for the Glass of Sunshine at The Deck Bar, next door to The Fish House. This specialty drink is a lovely mash-up of vodka, Limoncello, fresh strawberries, fresh-squeezed citrus and champagne. Sunsets and fresh seafood are an enticing combo for dinner at The Fish House in downtown Pensacola. Who doesn’t like a dolphin cruise? Catch a regularly scheduled tour through Chase-n-Fins in Pensacola Beach, with likely dolphin sightings and other marine life, along with a dose of local history. Other popular attractions on the beach side of Pensacola include touring Fort Pickens or walking the 177 steps of the Pensacola Lighthouse. Plan a Pensacola visit around performances by the Blue Angels, which creates a “boat party” off the lighthouse for locals and visitors wanting to take in the impressive air show. A statue honoring a famous local surfer is located near the fishing pier. Learn more about Pensacola and plan your visit at visitpensacola.com. All photography by Lisa Mowry.